I understand that the news has travelled around the world, so you are probably aware of the recent rioting in London. The trouble started on Saturday night in Tottenham, when a riot broke out after a peaceful protest at the local police station following the shooting of a local man by the police. On Sunday night, the violence spread to other boroughs. On Monday night, it came to the top of my street. I live about 5 minutes from Clapham Junction station, just half a block from the local police station. As violence started to flare on Monday, people at work started to leave early. I got out about 30 minutes earlier than I usually do, and was passing through Clapham Junction station at around 7:15 PM. There was a lot of police around the station, but no signs of trouble. I grabbed some food from the Sainsbury's and went home. By 8:00 PM, hundreds of people were trapped in the station, as the police shut it down while riots broke out on the streets just outside the station. Rioters broke into a number of local shops, including a number of department stores, sporting shops and electronics stores. People in the area reported that it seemed as if the police had just retreated, allowing the rioters to gain control. A local party and costume shop was set alight, and it burned uncontrolled for hours. In my flat, I watched the violence on TV. No riots on my street, but police cars and vans whizzed up and down my street all night, and helicopters hovered overhead most of the night. I saw a few hooded youths running down my street at one point, but they were obviously on the run and didn't cause any trouble near my place. The next morning, I walked to the station. The main road up to the station was shut down, and the smell of smoke was still thick in the air. Even in the areas where pedestrians were allowed, a number of shops had smashed windows. At the top of the street, along the police tape, were a number of journalists and camera crews. I surveyed the scene for a bit, and then headed off the long way around to the station. As I walked away, a man in front of me was stopped and asked, "do you mind spending a moment speaking to Japanese television about the rioting?" Great image for London in advance of the Olympics, I thought. I have some photos taken with my Blackberry, and there are better images from the newspapers, but there is one image I snapped that really struck me. 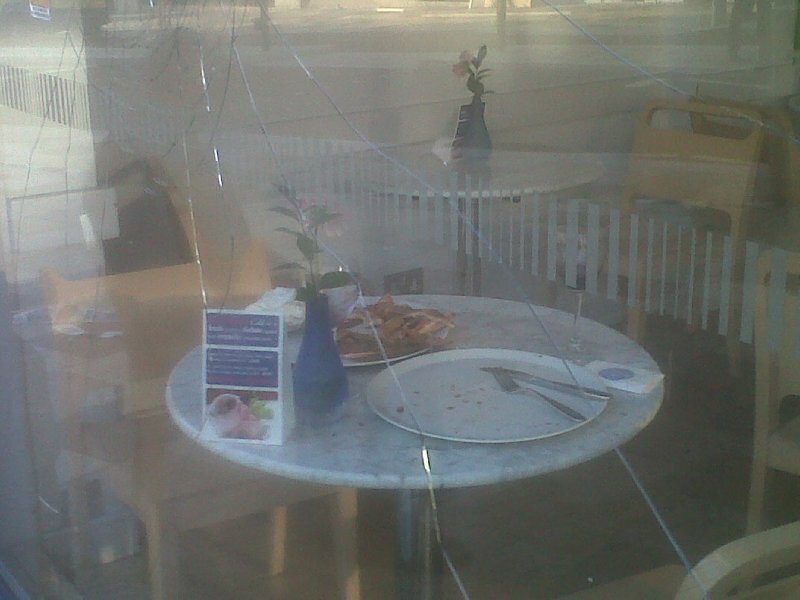 The Pizza Express on Lavender Hill with two smashed windows. Just beyond the window, tables with half finished meals still on them, including the one in the photo, with two half empty glasses of wine and slices of pizza on a plate in the middle of the table. I imagined the diners. In my mind, they were two old friends - middle aged ladies catching up over a glass of red wine. They talk about their husbands, and the men's mishaps with DIY projects. They speak of their children, and their successes and troubles with jobs and lovers. Talk turns to their young grandchildren, and the ladies compare development timelines. Is young Billy walking yet? Has Jenny said her first word? I imagined these two ladies, leaning in close sharing a funny anecdote, as the rioters came up the street, so quickly for any one to react. I imagine the two middle-aged ladies' fear as a hooded boy raises a cricket bat and swings it at the window, just at head level with the women. I can see them now in my mind, these two ladies I have created, their eyes wide, mouths agape. One screams, "Oh, dear," her voice shaking with fear. One of the waiters grasps the ladies' arms. "Please, follow me," he says, leading them to safety out the rear door. The ladies flee the scene up Lavender Hill towards the police lines, their hearts racing and hands shaking with fear. They wonder why, but there is no answer. All they wanted to was a nice meal and to catch up. hey thanks for sharing this one.. im praying for your country..